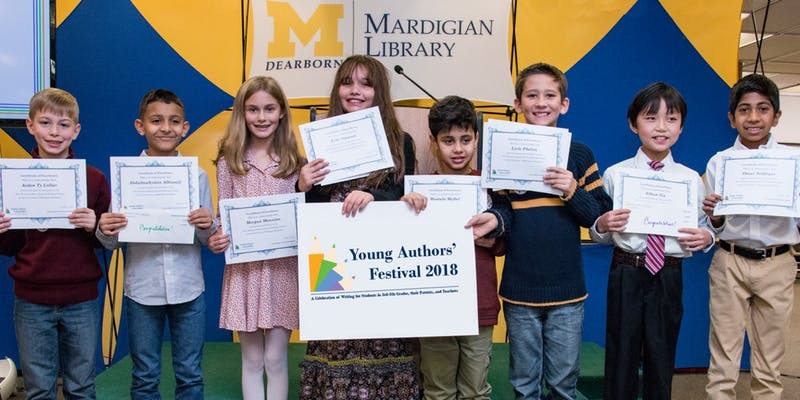 The Young Authors’ Festival is a FREE half-day event focused on children in grades 3 through 5 for the purpose of helping children increase their literacy skills. Children of ALL ages are welcome, but breakout sessions are designed for children in grades 3-5. The festival features a visit by a Michigan author and/or illustrator, interactive breakout sessions for children and adults, writing contest awards, and a book signing. The event is held at the Mardigian Library on the campus of the University of Michigan-Dearborn and breakout sessions are led by pre-service teachers enrolled in the College of Education, Health & Human Services.